Wyatt Kahn, Work, A Performa Commission, 2015. Courtesy Performa. Photo Paula Court. Decoding the meaning of an artist's work has never been easier than in Wyatt Kahn's Work. In this post-modern puppet show, Kahn's individual paintings are translated into non-anthromorphized puppets. 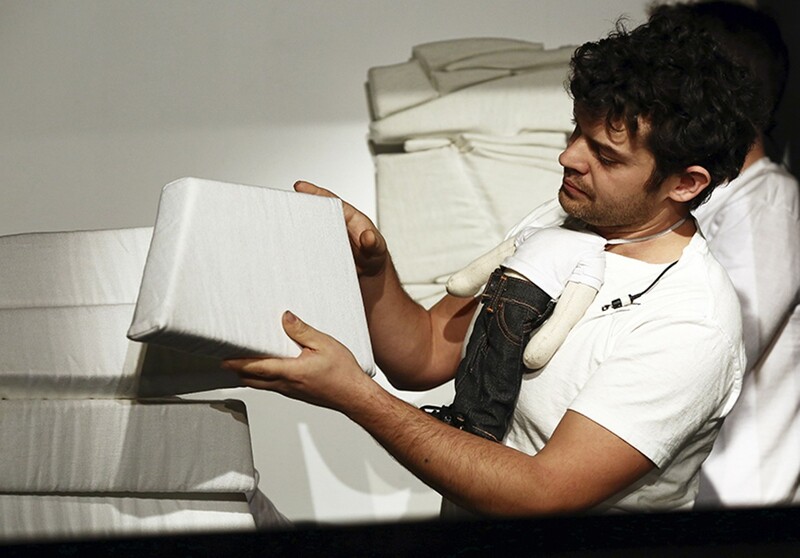 Kahn plays the puppet version of himself, who is attacked in his studio by his own creations. Each puppet has the same mindset that the artist experienced while creating that particular painting, and each of them challenges the work and its meaning. It's a wry take on the art of art criticism and the responsibility an artist bears for his or her own creations. Work is performed at 7:30 p.m. Thursday and Friday (December 10 and 11) at the Contemporary Art Museum St. Louis (3750 Washington Boulevard; 314-535-4660 or www.camstl.org). Tickets are $15 to $50.